Have you ever met someone and just "clicked"? * That happened the first time I met Teri Lucas. I think we officially met in person at a modern quilt guild, even though we had been internet buddies for a while. She liked it, too. She made one in her own Teri-style as a sample when she was teaching at Houston last fall. It was Krispy Kreme donut bread pudding. You would have had the same reaction, I promise! She made me a "Bang Head Here" quilt! I gave mine away and I miss my quilt. This is hanging on my sewing room wall now, ready to help me out in case of emergency. I can't wait to meet up with Teri again. Watch for her machine quilting classes at some quilt shows this year! * I know that the ? is technically supposed to be inside the " ", but it just seems weird to me so I choose to ignore that rule. I am a punctuation rebel. 2012 was a whirlwind year of travel for me. One trip was 25 days long. One trip was to Russia. One trip was to Australia. Most of my year was spent preparing to travel, traveling, or recovering from travel. Because of this, some things slipped through the cracks. Like my sister's anniversary in October. And blogging (but we will not talk about that). I made my sister a tablerunner for her anniversary, but I did not start it until 2 months after her anniversary. I gave it to her with her Christmas present because I am a terrible sister. Maybe if I start her anniversary present now, it will be done by October? I am joining another Quilt Along! Amy Ellis is offering Dancing Stars as a free paper-pieced quilt along. I am not a paper piecer, but this quilt is so cute I just had to do it! I am an aunt several times over. I have one set of neices/nephews that are 17-21 years old. This year I became an Auntie again and my baby girl needed some books. I tried to find some of my children's favorites, but decades later most are out of print. Does anyone remember a board book called Allie Alligator? "Allie Alligator is a funny fellow. Every time he sees a color, he changes his hat. ... Black is the color of night. Shhhhh. Baby animals are sleeping." Another treasure is A Million Chameleons. "A million chameleons all dressed in vermilion were dancing around in a garden pavillion..."
I went for Moo, Baa, La-La-La, some Curious George, a Hello Kitty, and a bath-time book. I stopped at the Quilt Basket to see if they had any fabric book panels. They did! I think a new year is a great time for making changes so today I took a deep breath and made a major change -- I got all my hair cut off! Look at all the hair we have between us! Are you ready to see the final result? OK, so that is not really my "after" picture, but I totally bought that wig. Now only one of us has long hair! * This ponytail will be used by someone with a very rare autoimmune disease who is being treated with chemotherapy. My dear friend has some lovely red dishes. I thought that she might need some lovely red dinner napkins to match. Happy birthday, dear friend. Think of me when you are sloppy at the dining room table. 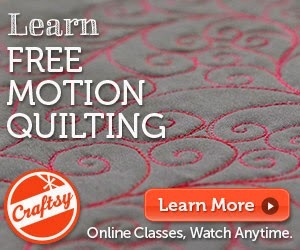 Look at what just showed up on the Handi Quilter Blog! What I worked on today. A future finish! 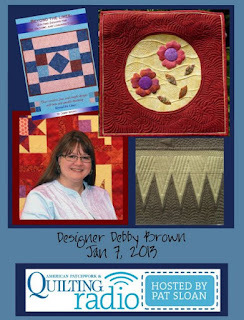 Are you planning to listen to American Patchwork and Quilting Radio this afternoon (4pm eastern)? If you are not available, do not fear!!! These are saved and you can listen to it later tonight (the second you become available) as many times as you would like! For this show, I am giving away a copy of my book Beyond the Lines. Leave a comment by 5pm eastern Friday, January 11, 2013 to be entered in the giveaway. 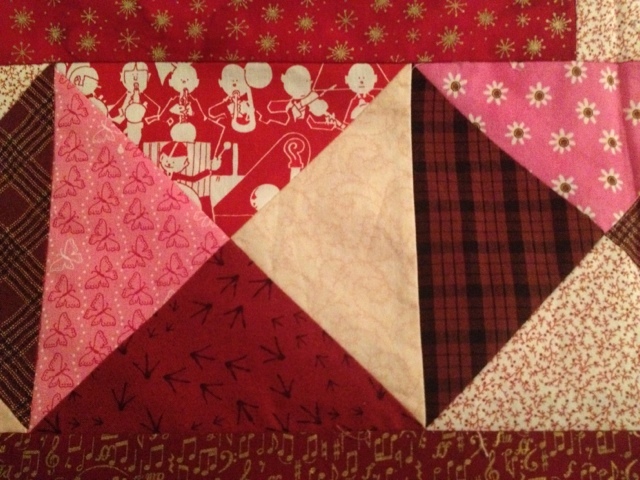 Have you been following Bonnie Hunter's Easy Street mystery quilt? I have started three of her mysteries, but this is the only one I ever FINISHED!!!!! It may not stay there, but I want to be able to look at it for a while. I am a machine quilting teacher and often provide kits for students at quilt shows. I buy bolts and bolts of fabric. Last year it was green. I had a lot of little ends of bolts left, so I stitched them with the leftover pieces of the quilt to make the back. It was not enough though. I am so in love with this quilt. Thank you, Bonnie. Thank you, thank you, thank you!!! My mother-in-law wanted a new toaster cover for Christmas. Her toaster is from 1966, and her toaster cover is of the same approximate vintage. My husband looked online and was not encouraged by the toaster covers he found there. "You could probably make one," he challenged. Never one to back down from a challenge, I took the dimensions of the toaster (stealthily supplied by my father-in-law) and started piecing a toaster cover in the recommended color of "yellow." I promise that it looks much better in person. My husband's comment, "It looks like it could be nicer that what I found online," nearly landed him in some hot water, but I kept telling myself that he meant it as a compliment. My mother-in-law loved her toaster cover. And my husband is still alive. was that enough exclamation points? If you are as excited as I am (!!!!!!!!!!!!! ), go and listen to her previous shows. I love to listen to them while I am quilting. I have "met" so many neat designers through her show! My Christmas quilt from 2011. My brand new quilt for January 2013! 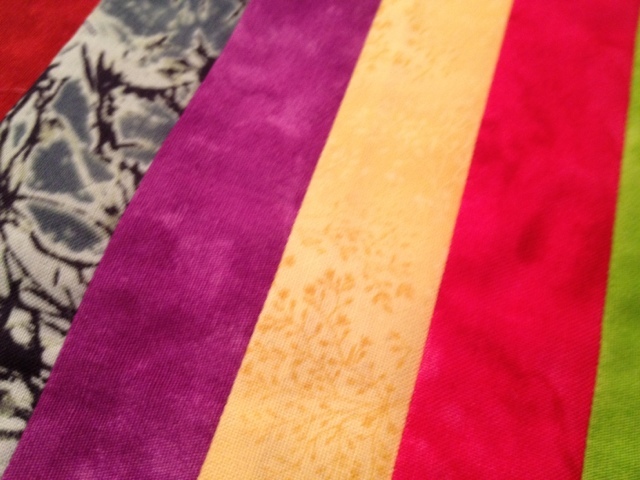 Do you change your bed quilts with the seasons?